Reverberated sound can make objects visible. The sonar is used in the shipping industry to acquire information about the seabed or shoals of fish, while gynaecologists use ultrasound images to study foetuses in the womb. Material testing procedures that regularly check for fissures in rail tracks or aircraft support structures are also based on ultrasound. 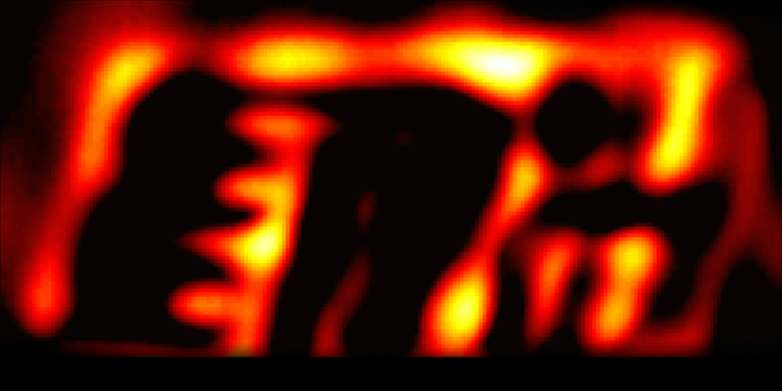 Researchers at ETH Zurich have now developed a new type of acoustic imaging device which, rather than producing a photorealistic image of an entire object, shows only its contours and edges. "This type of measuring method delivers similar results to the edge detection filter in an image-processing software, which allows the outline of prominent photo objects to be identified with the click of the mouse," explains Chiara Daraio, Professor of Mechanics and Materials. Her method, however, is not software-based. Instead, it extracts the contour information during the acoustic measurement stage. To understand just how this acoustic edge detector works, it is important to know that sound waves are reflected off edges in a remarkable way: The acoustics near the edges is dominated by so-called evanescent waves. These waves have a much shorter wavelength than the incident sound waves that producte them. As the evanescent waves decay very fast as they propagate they can only be measured in close proximity to the edge. Methods to recover information contained in these waves have been developed in the past; however, the ETH researchers have now devised a new method that intensifies the evanescent waves and differentiates them from larger sound waves that are reflected in the "normal" way. Central to this new method lies a new polymer structure developed and produced on a 3D printer by Miguel Molerón, a postdoc in Daraio's group. 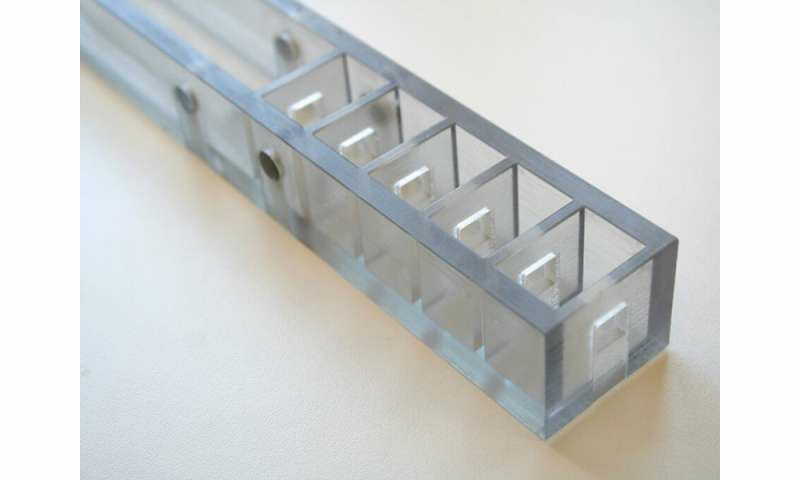 The structure is a pipe with a square cross-section, the inside of which is divided into five adjoining resonance chambers connected via small windows. "The resonance achieved by this structure intensifies the evanescent waves, and the successive chambers filter out the longer waves," explains Molerón. At the head of the structure, four microphones measure the transmitted sound. To create an outline image, the scientists bounced sound with a specific frequency off the object through a loudspeaker. They attached the polymer structure with the microphones to a robot very close to the object's surface, which enabled them to systematically scan the entire surface and generate the outline image from the measured sound data. According to the scientists, the new measuring method is most useful when the aim is to record relevant information about the object as quickly as possible rather than obtaining a perfect image. "We have created an acoustic imaging method with which any unnecessary information isn't recorded," says ETH professor Daraio. "Outlines and edges are sufficient to classify objects based on their shape and size, for example, or to identify fissures or defects on the surface of materials," adds postdoc Molerón. The work conducted by the ETH researchers is currently just a proof of concept. The method still needs to be refined before it can be applied in practice. The scientists used sound at an audible frequency in their study. However, it would also be interesting to adapt the method for ultrasound that has shorter wavelengths. "Because the size of the polymer structure has to be adjusted to the operational wavelength, we need to miniaturise the structure. We now want to find out how far we can go with it," says Molerón. He is aiming to improve the acoustic imaging method for potential use in biological research or medicine. The article has one technical error. Evanescent waves have the same acoustic wavelength as the insonifying wave, but they decay exponentially as a function of distance from the object. That's what makes them difficult to detect, and why the detector has to be so close to the target. Unlike "traveling" or "propagating" waves that satisfy the typical space-time wave equation, evanescent wave have a decaying spatial exponential term. One can look up the term "nearfield acoustic holography" and get a good background on it. I researched sound propagation using 4D Fourier transforms (into k-space), but generally ignored the evanescent term because it was hard to measure (at ultrasound frequencies) and even more difficult to back-project. The acoustic filter described may have other potential uses in addition to this application.